Would you like a spot of tea? Well it’s amateur hour! Don’t get excited…I’m talking about my video editing skills, not your sketching…silly. I don’t have exactly the right equipment and believe it or not, it’s incredibly difficult to video my work with my phone in my left hand while sketching with my right. That being said, if you’ll bear with the rudimentary photos/video footage and hopefully-not-too-vague instructions, you can learn my process and create a sketch of your own…..perhaps the first sketch of a well-loved sketchbook. I selected one of my favorite things to sketch, a teacup. This one is fairly simple in shape and detail and a good confidence booster if it’s your first watercolor sk etch. For this exercise you will need a cheap watercolor or craft brush (something soft, not bristly), a small set of watercolor pencils, a permanent pen, and of course paper or a sketchbook thick enough to handle some water. I am using my Faber-Castell Pitt Artist Pen size S (but a Bic or a Sharpie pen works just fine), a watercolor pencil set from Faber-Castell, a cheap watercolor brush that came in a set of 5 at Hobby Lobby, and my Strathmore 500 Series Mixed Media Journal. First I look closely at my subject. What colors are represented? I only used blue, green, yellow and brown in my sketch. Where are the shadows and highlights? You can squint your eyes to blur your focus and see these better. I won’t get into too much detail on shading yet. This exercise is really just meant to get you loosened up and having fun. Step 1: Draw the outline of your subject. Don’t worry about scale or proportion. Just draw what you see. My teacup drawing isn’t perfectly round either, and that’s okay. It’s just a sketchbook after all. Step 3: I decide to go ahead and finish the outside of the cup by adding some water with my brush. Dip your brush in the water and blot a little with a paper towel so that you don’t drown your paper. I first deepen the color of the blue and green parts with water and let that dry just a few seconds before moving to the brown. To finish the outside of the teacup, I start my brush on the side with the brown shading and drag it across the cup. This way, it gets lighter and lighter as you go to the right, creating the illusion of the roundness of the cup. Leave the lightest parts alone of the cup alone. This part is probably best shown by the video below. Step 4: Now, let’s move to the inside of the cup and the tea itself. The shadows on the inside of the cup are to the right so I add brown on the right inside rim. For the tea I use yellow on the left (highlight) side and brown on the right (shadow side). I blend the two colors of the tea with water using my brush. Step 5: The shadow the cup casts on my desk looks like it’s falling behind the cup. I draw a thin line of shading underneath the cup and a larger block of color up each side. For the shadow I use brown and a little blue layered on top. Then add water and sort of muss it all up and you’re done! Bonus: I like to add a sentence or two in whimsical lettering about the sketch….where I am, what I’m doing at the time, how I’m feeling….whatever feels appropriate to say. Date, sign your name, or frame an outline in pen if you want. Now admire your work, let it dry, and move on to a fresh page. You did it and hopefully had fun in the process! I definitely did! Cya next week, artists. Until later, this is KristyMichele….signing out. 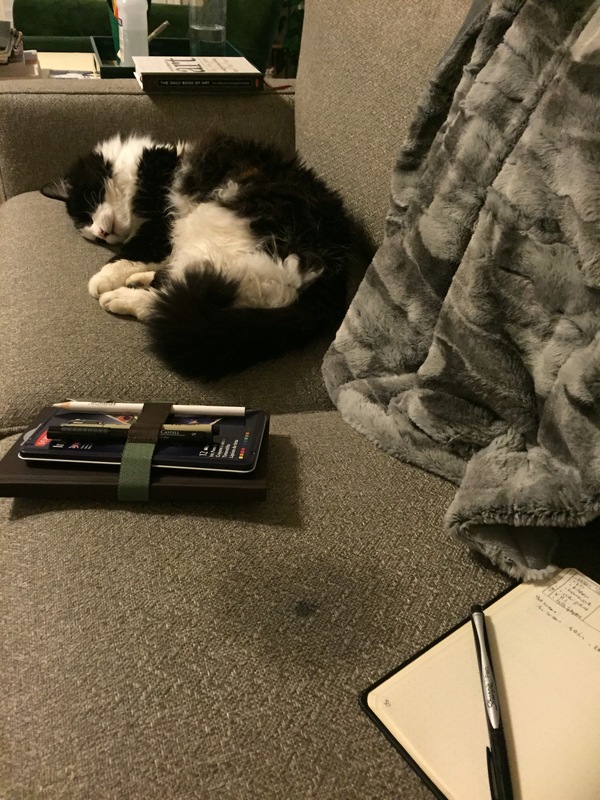 Author tuxedocatartPosted on March 6, 2016 March 6, 2016 Categories Learn to be sketchy, Sketchbook chronicles, UncategorizedTags how-to, sketching, WatercolorLeave a comment on Would you like a spot of tea? Welcome to March, fellow artists! The weather is warming up. The daffodils are in bloom. Tonight I write this to the sound of a spring thunderstorm and Tuxedo Cat fights the laptop for a space on my lap to sooth his nerves. Ahhhh…..spring! I hope you are ready to see and create some really cool stuff this month. Here is a sneak peak into my March itinerary. This month I am inspired by my bulb garden to learn to make a paper daffodil centerpiece. I have bowls, vases, and trays galore just waiting to be filled with something pretty. Now flat surface spaces to display those beauties?….ehhhh….not so much. But never mind that! For you paper crafters out there, I will be showing how to create your own paper daffodils……for the more adventurous, perhaps a spring centerpiece similar to mine. In fact, I’d like to create and feature a different paper flower project each month. We can all learn more about paper crafting as I start my own collection of flower studies and petal templates. I have enrolled in another course of Sketchbook Skool called ‘Seeing’, where I will learn to see the world around me more clearly and continue my almost-daily sketching habit. I will feature tutorials of quick and easy subjects. For beginning sketchers or those who are timid to try, I say “start small and gain confidence”. And gain confidence we will! As the grand finale of the month, I intend to create a pair of painted Converse sneakers. I love graffiti art…I love cartoon graphics…I love street style…and I LOVE my Converse sneakers. How much fun does it sound to have my own custom-painted pair?….created by none other than…..the ever elusive…..ME!…..KristyMichele. Ok, ok….stop rolling your eyes! Seriously though….stop. Inspiration and sneaker design to be determined…..
Any of you who know me personally know I can’t sit still for long. I will forever be trying new art supplies, learning new skill sets, searching for other art blogs, and researching just about anything I can find about creating……so what I find and love, I’ll share. If you have or find anything you’d like featured…ideas you’d like to see….skills you’d like to learn….please email me or leave me a comment! I’m always open to my readers’ suggestions. Oh, and I almost forgot…..each month will have it’s own inspirational quote of the month….just because I love quotes. Sounds like we’re headed into a busy (and fun) month of projects. Let’s spring forward and get started! Until later…this is KristyMichele signing out. Author tuxedocatartPosted on March 1, 2016 Categories Uncategorized1 Comment on Spring forward!….shall we? Well it’s been three weeks and I am halfway through my first Sketchbook Skool course called Beginnings. Did you followers think I fell off the face of the Earth? Nope! Just learning and sketching and studying and Instagramming…..but I figured I would stop in tonight and write about what I’ve learned so far. It’s okay to sketch mundane objects or log the details of the boring details of life. Life doesn’t have to be exciting each and every day to create a daily art habit. Just start sketching….anything that catches your fancy! Make a habit of it…..you may feel critical of your drawings or paintings at first, but stick with it….you won’t regret it. As they say, practice makes perfect…..and even if it doesn’t, who wants a perfect sketchbook anyway? Mistakes make your sketchbook better….more real…..more uniquely YOU. Don’t pressure yourself. If you skip a day or a week, don’t beat yourself up. This is supposed to be fun and a way to de-stress……so have FUN! If you start a journal and find you hate it (highly doubtful….but I’m biased! ), feel free to chunk it in the nearest recycle bin or dumpster <cringe>. If you do love it, take your sketchbook and at least a pen with you at all times. You never know when the perfect opportunity will present itself…..which brings me to….. Sketch in public! Sketching in public can be intimidating at first, but I can promise you that most people will either be curious and impressed or too busy to even notice. I like to keep my phone with me in case I can’t finish a sketch and need a photo reference to work on it later. A sketchbook. I like using a 5.5×8 inch bound sketchbook. I feel cramped using something smaller and anything larger isn’t portable enough for me. I really like my Strathmore Hardbound 500 Series Mixed Media Art Journal. The pages fold reasonably flat so that you can sketch across adjacent pages and are thick enough so there’s not much bleed-through. A pen. Preferably a waterproof permanent pen like Faber Castell Pitt artist pen (superfine nib) or Sakura Pigma Micron in 02 or 05. A lot of artists, apparently swear by using just a Bic ballpoint pen. I’m not a big fan of ballpoint pens, but to each her own, and on the plus side, Bics are incredibly inexpensive and easy to find. I use a Sharpie pen in my planner notebook and occasionally use that to sketch as well….also easy to find in any Walgreens or Target. A small set of watercolor pans or a small set of watercolor pencils. I have a Windsor & Newton Cotman pocket sketchbox, but I prefer my Derwent Inktense set of 12 pencils. I find them easier to carry and I can use them dry or wet. Sometimes if I am feeling rushed for time or don’t want to deal with watercolors in public, I color in parts of my drawing with these pencils, then add water to them later to create a wash or brighten the color. Faber Castell also makes good watercolor pencils. A small round watercolor brush and container to hold water. But better yet…..there are these nifty things called waterbrushes. [—I literally just discovered these….and I call myself an artist!….for shame!] They hold water inside and with the press of a button or tiny squeeze of the reservoir they dispense a small amount of water, eliminating the mess of a container of water. Brilliant!! I like to keep a tissue or small paper towel handy for clean the brush tip or soaking up extra water when I accidentally add too much to my drawing. Optional but for an added security blanket: a standard no. 2 pencil or set of sketching pencils and eraser. Completely unnecessary but I carry these sometimes: a brush tip marker for bolder lettering and painterly swooshes (I like Sakura Pigma brush marker), and a white gel pen for highlights and layering writing and designs over watercolor (mine is Sakura Gelly roll). Okay artists…..enough for today. Now go drag out your supplies or shop for new ones and meet back here next week for Getting Skool’d part 2. Cya soon! Tuxedo cat rests after a hard evening’s work creating his masterpiece entitled Making My Mark on Mom’s New Couch. This particular work of art was created by napping on a Sharpie pen that was accidentally left uncapped and unattended. Always the art critic, I tried unsuccessfully to ‘erase’ the unwanted drawing. It’s not going anywhere, however so for now I will try to appreciate it’s classic simplicity. Maybe one day I will grow to love it…..or just turn the couch cushion over. Productive people say it is highly important to have daily rituals to get you ready for an awesome day and keep you motivated. I have a few already, my morning cup of tea and ‘beddy-bye’ tea/reading at night to help me sleep. This year I have resolved to read…. …every day to keep myself inspired and motivated to create, but I wanted something more. I have always admired artists that keep a running sketchbook of their daily adventures and travels. My mundane adventures never seem very sketchworthy and drawing/watercolor are not my forte. So today I signed up for a Sketch Book Skool course that I found out about from a blog post from Danny Gregory . I’ve been an admirer of his work for years and he’s teaching one of the modules. How did I not know about this skool before?! I can’t believe I just barely got in the class before it starts on Friday! I will learn not only how to keep a sketchbook but also how to build a daily art habit. I’m so excited I can barely contain myself! Stay tuned for sketchy updates….. Since I don’t have any current projects running…..drumroll please…..here are the results of Santa’s Workshop 2015! Perhaps just a snippet of what I’ve been doing and trying….succeeding and failing at. Painted boxes were easy and fun. I tried out metal stamping for the first time….but the real fun was all about the steampunked nerf guns! I’ve been fascinated by steampunking for quite some time and this is my first crack at it. I definitely want to delve more into the steampunk era, as well as making use of my new metal stamps with some jewelry projects.